Firefighters rescued a construction worker from 300 feet underground at the Second Avenue subway construction site after a piece of equipment fell off and struck the worker, authorities say. Officials said it appears a piece of concrete-cleaning equipment had come off and struck the worker in the left leg underground near 84th Street and Second Avenue. 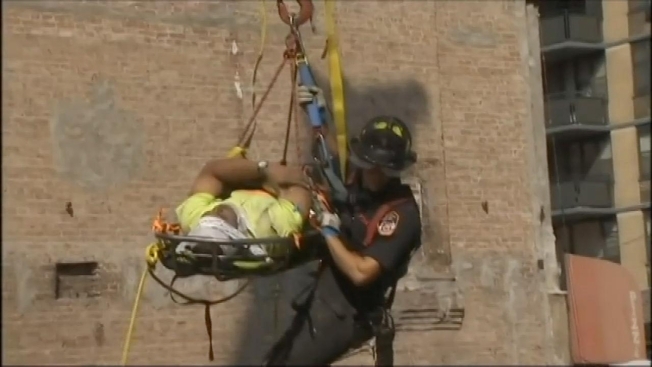 Rescuers had to go underground and bring him over one block to the evacuation site at East 83rd Street, where they hoisted him above ground with a crane. The worker was taken to Cornell Weill Hospital, where he's listed in serious but stable condition. The Second Avenue Subway project is moving along slowly but surely, and now there's word that residents in East Harlem will benefit from the major project with an added phase of construction. Andrew Siff reports.